What to do when you have broken glass at home. Broken Glass at home can be very dangerous. It is important not to interact with broken glass at all if you can help it. I have seen workers who are trained to work with glass, with many years of experience and proper personal protective equipment get injured with injuries that stuck with them for the rest of their lives, even after they acted in a safe manner. Broken glass can be unpredictable and difficult to manage, so your best bet is to stay as far away as possible until you can have a professional come and take care of the problem, however in many cases that simply isn’t possible so here are a few ways to stay safe. Lock up any pets that can get in contact with the broken glass. They can track the broken glass around the house and it is very difficult to find every little shard of glass after all it is see-through. Make sure you aren’t tracking glass shards around the house as well, they can stick you your shoes and you could be tracking them around the house as well and someone could get injured who never came anywhere near the broken glass site. Do not ever touch broken glass without gloves on. But still be careful even with gloves on. Most likely you just have regular gardener gloves and sharp glass can slice right through those white gloves that everyone keeps around the house. So even with the proper gloves on, make sure you are very careful. Pick up any glass that is on the floor and vacuum up small shards with a shop vac. Glass that is on the floor should be removed and placed directly in your outside trash receptacle. Do not place glass in your kitchen trash can. It will cut right through the bag and may spill out causing the trash to go everywhere and the glass make cut your leg or foot as you are walking the trash bag out to the street. Never place glass in a plastic bag, always place directly into a hard trash receptacle that will go directly into the trash truck. Do not try to remove large glass shards that are hanging from the window opening. This is the most dangerous part of reglazing a window. These shards are still there because they are stuck into the window via glue or tape and it is best to just leave them alone. Trying to pry them away from the window could cause them to crack, burst and shatter, causing undue injury including shooting shards of glass into your eye, trust me it has happened to me. If you feel unsafe it would be better to place duct tape on the broken glass pieces to keep them together in one large broken piece and let the glazier take the entire glass unit out in one piece. During this time you can also use duct tape to place cardboard over the exposed area to keep the elements from entering your home or the warm or cool air from escaping your home. 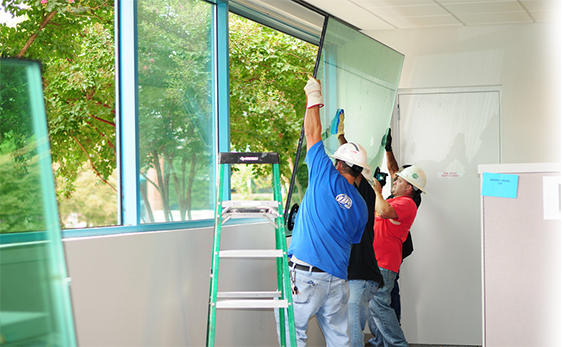 Remove any obstacles that will get in the glass repair technicians way when he does come to your home. They are not responsible for your antique lamp sitting on the end table next to your window. You need to remove any obstacles and give them a clear path to do their work. A few other things to remember. . .
Tempered glass is generally safer that annealed glass. You can tell if glass is tempered because when it breaks it shattered into thousands of small pieces about a centimeter in diameter. This glass can still cut, scrape and bruise you but it is unlikely that it will cause a large gash requiring a visit to the emergency room. This can easily be swept into a dustpan and placed in the garbage pail. The most dangerous glass is the large shards, stay away from them, but don’t be worried about the small tempered pieces. Wear gloves, sweep up the pieces and use a shop vac to vacuum up the remaining small pieces. Glaziers are not maids. They are not there to clean up the mess that someone else made. It always amazes me when people complain that the glaziers didn’t clean up their mess. The glazier didn’t make the mess, the person who broke the window made the mess. The glazier was called out to install new glass, not to clean up messes. (Would you like him to load the dishwasher while he is there as well?) The glazier will (in most cases) clean up any messes that he causes, such as caulking tubes, etc, and may remove some large dangerous glass pieces “as a courtesy,” but they are not there to provide clean up services. If the site is that bad that you are unable to clean it up, you may want to consider hiring a clean up company to clean the mess. Remember, glazing is a highly skilled trade. When you have someone come to your home, you are paying for their services. If you are paying a “glazier” to do clean up, you are over paying. That would be like paying the cable guy to come over and change the batteries in your remote. Follow these steps when you have broken glass at your home and you should be able to have a worry free, painless glass repair service experience.